Here's the breakdown: the phone keeps the 5-inch 720p screen from the 2014 version, but upgrades the internals with a Snapdragon 410 processor from Qualcomm and a 13MP rear camera (5MP on the front), the same camera as the Nexus 6, plus a color-balancing flash. All models get IPX7 water resistance (up to a meter for 30 minutes), LTE connectivity, and a 2470mAh battery. There will be two models offered, one with 1GB of RAM and 8GB of storage, and a higher-end model with 2GB of RAM and 16GB, both of which use a MicroSD card slot. Both models get "turbo" fast charging. 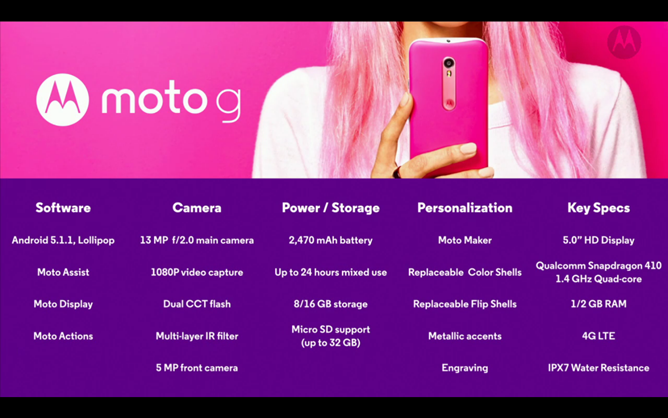 As usual, the G will be sold directly on Motorola's website to various markets in unlocked fashion. Software is Android 5.1. The looks of the device are in line with Motorola's 2015 line, with a vertical strip on the back connecting the camera module to the Motorola logo. The edges and the rear accent are metal, while the plastic backs are now textured. 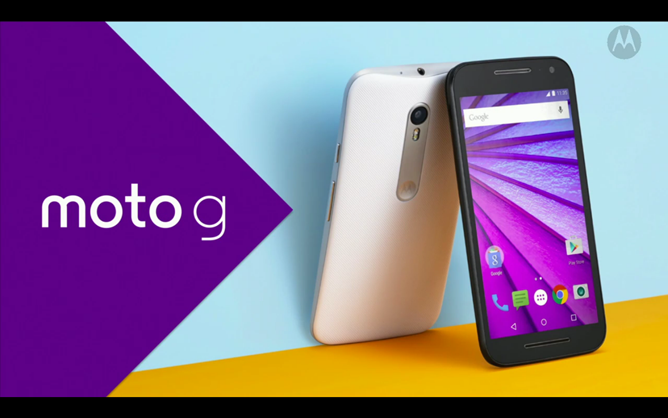 Standard colors are black and white, but the Moto G will also get access to the Moto Maker tool with colored accents and backs. Prices are "one third the price of flagship phones," (about the same price as the current models, then) and the phone will be on sale starting today. Update: Motorola's site has been updated with Moto Maker access for the new Moto G. The price is $179 for the 1GB/8GB version and $219.99 for the 2GB/16GB version.